I am so glad that my friends unabashedly love to eat as much as I do. We love it so much that we have taken it upon ourselves to have “food nights” on a somewhat regular basis to help survive the doldrums of winter. We figured, if it’s miserable outside, let’s just gorge, drink and hibernate inside. Why get dressed up and “go out”? If it is so cold my face hurts, it is highly unlikely I’ll attract any male suitors anyway. Friday nights at bars in short dresses and high heels can wait until the spring. Until then, I’ll be stuffing my face. We kicked off our first official “potluck” a couple months ago. There was a Hawaiian kale salad, pan fried cod sandwiches, slow cooked Thai chicken, vegan desserts and more! Before we decided on throwing this shindig, I had already been thinking about enchiladas for weeks, but didn’t want to do any old Mexican throwaway. I figured a chicken filling would be safe place to start. Next concern, several people were afraid I would melt their mouths or something. Story of my life. Taking that into account, I was able to determine how to execute the sauce. 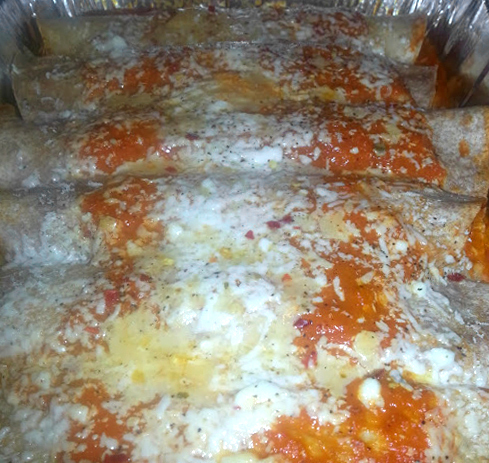 Enchiladas are basically smothered in a mole, which is a chili pepper based sauce. My chili of choice had to be chipotle. The smokey, earthy pepper has a bit of a kick, but it knows how to play with sweet flavors, which were crucial to incorporate so everyone would indulge. Now to decipher how to make this mole all savory and luscious… Temporarily stumped, I decided to take a drive up to Trader Joe’s (this place is like Disney Land for me). I collected all the ingredients I knew I needed, then, for reasons unknown, I was compelled to check the dried fruit section. There it was. A glowing beacon of mouthwatering inspiration, chile spiced mango. My culinary guardian angel had done good. This was going to work out just fine. Let’s get down to the sauce recipe straight away. Get a small sauce pan, douse it with olive oil, toss in garlic, shallot and bell pepper. Simmer it all for a hot minute, then add your mango. If you think chile coated mango sounds weird, leave this page immediately. It is a combo that could not be more right. Make sure you try a piece before throwing it all in the sauce. Now add your chicken stock and lime juice. You can cover the pot and let everything break down for a bit. The dried fruit will actually reconstitute and soften. Once this happens, get a hand blender and puree away. Once it’s fairly smooth, add the chipotles, extra adobo sauce and tomato paste. Keep stirring and start adding the orange mango juice. This juice was originally something just hanging out in my fridge. I thought, hey! More mango, more citrus, why not? You could use regular OJ, but I recommend splurging on the mango infused variation. You won’t mind it at breakfast, I promise. I hope you didn’t put the hand blender away, because you need to hit sauce one more time to liquefy those peppers. 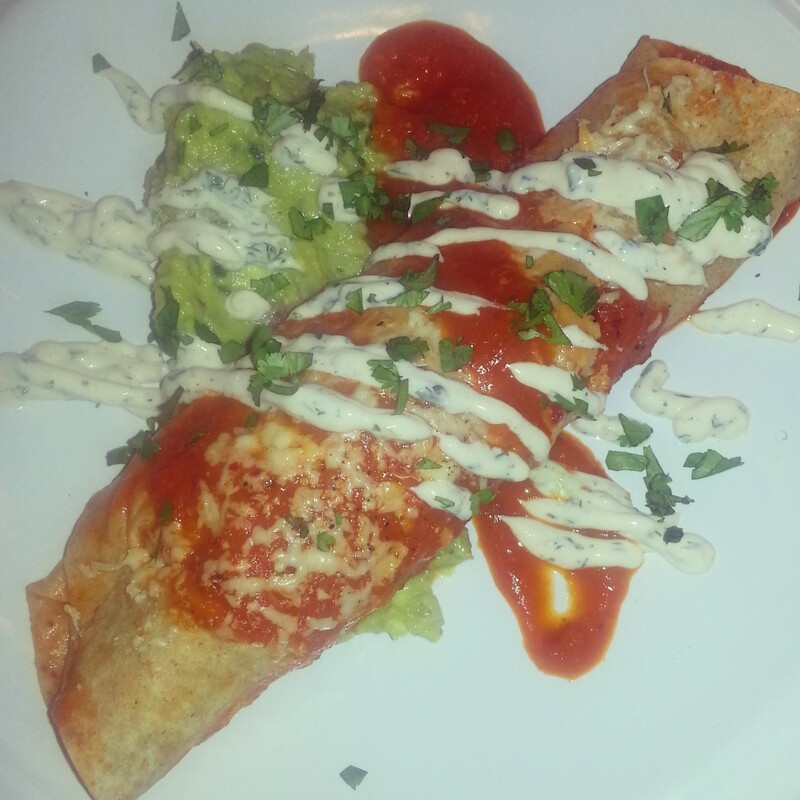 Add a little s & p to your taste preferences and you are done with a major step in this enchilada process. OK, so preparing the chicken is super easy. This works best in a basic slow cooker/crock pot. Lightly coat the chicken with a touch of olive oil and a touch more agave. Season it liberally with the spices listed above. Finish by delicately covering the chicken with some of the chipotle mango sauce. Now turn the slow cooker onto a low setting and allow magic to go down for the next 6 hours or so. You will know the chicken is done when you can easily shred it with your hands or a couple forks. At this point, pull all the poultry, give it a taste and add any additional seasoning you feel necessary. Too spicey? Add more agave. Too sweet? Add black pepper and your favorite hot sauce. Something else missing? Salt. High blood pressure tastes good. 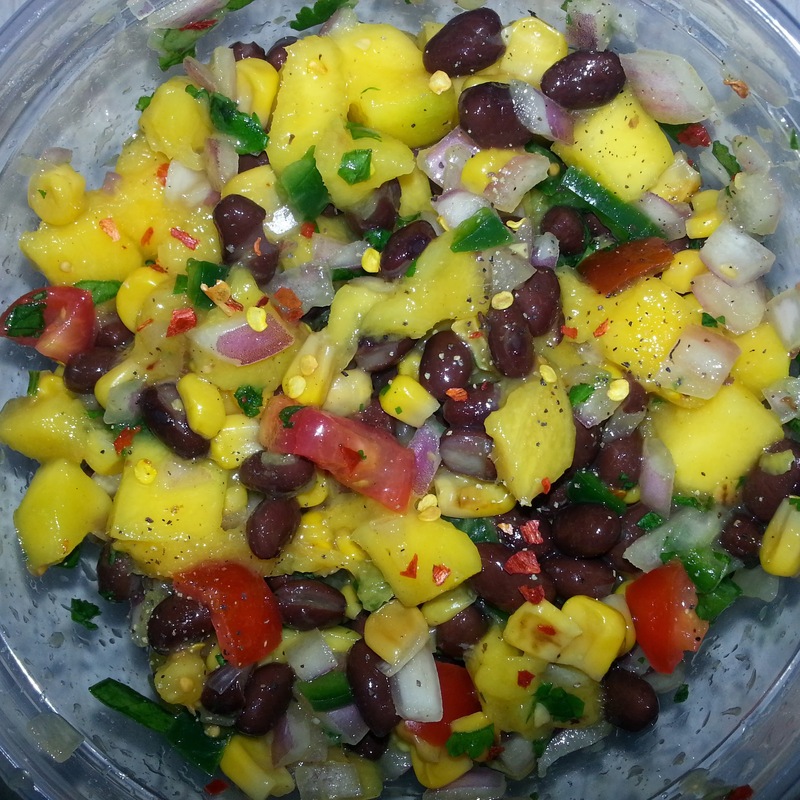 Next up, black bean & mango salsa. This will be going inside the enchiladas with the chicken. You can prep this while your chicken slow cooks. If you cannot figure out how to make the salsa from the ingredients listed above, you do not belong here. My only advice is to let everything sit for at least a couple hours so all the flavors marry. First, warm up the tortillas in the microwave for about 40 seconds. This makes them pliable and easy to shape. Pour a decent amount of the mango chipotle sauce in a deep dish that is big enough to fit an entire tortilla. Immerse one side of the tortilla in the sauce, then flip it over and fill the sauced side with chicken, salsa and cheese. Roll each tortilla fairly tight. Repeat this process until all tortillas have been filled and rolled. Now, coat the baking dish you plan to cook the enchiladas in with a thin layer of sauce. Place each enchilada seam side down in this dish. Finish by topping with additional sauce and cheese. 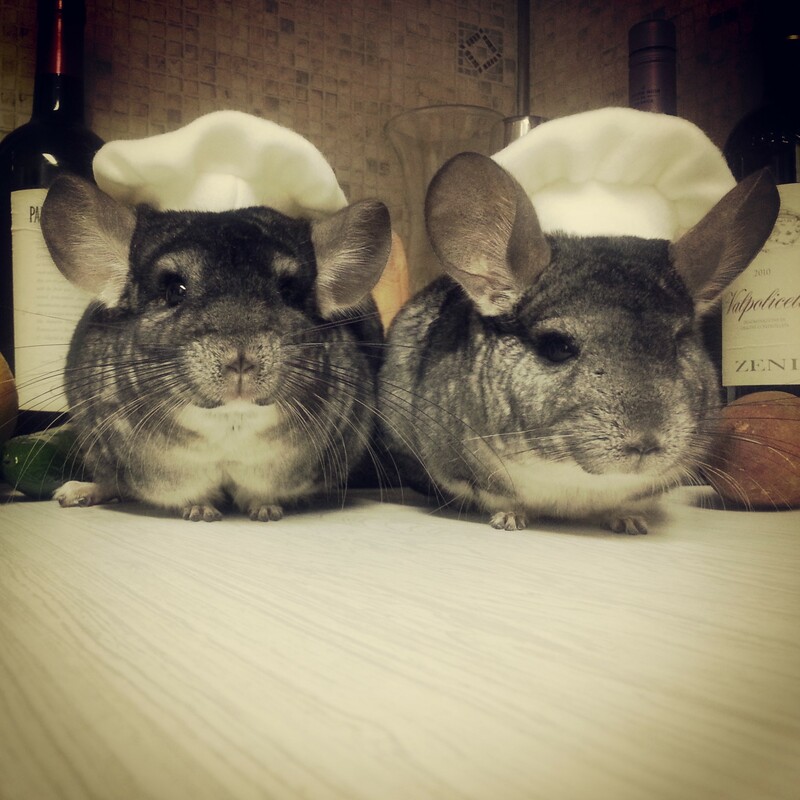 Bake at 350 for 20-30 minutes. When everything is warmed through and bubbling gloriously, you know you’ve nailed it. 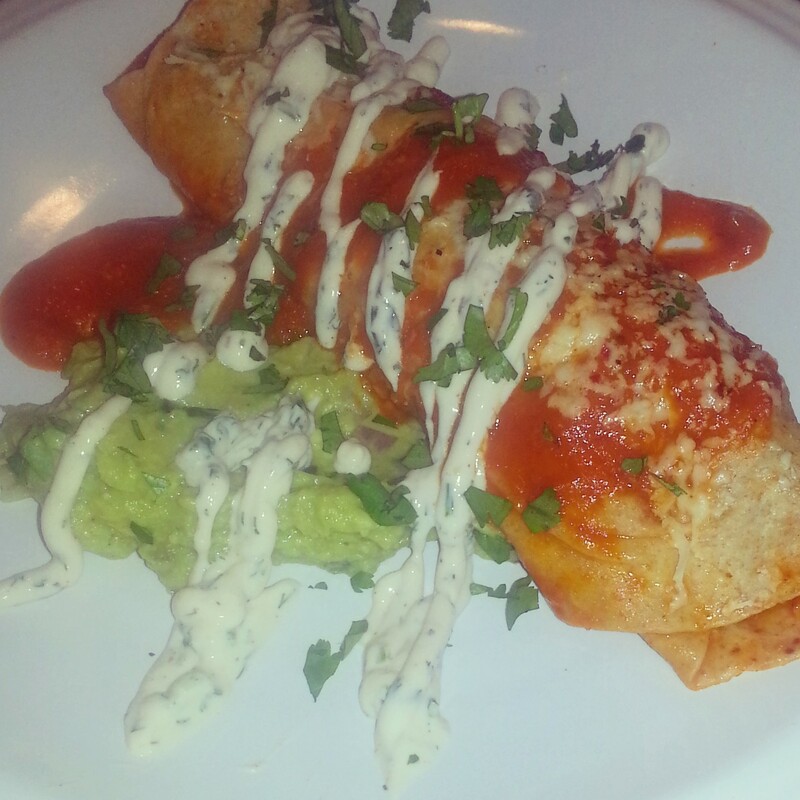 I recommend serving these enchiladas over guacamole, splashed with fresh cilantro and finished with a ranch inspired sour cream drizzle. Do not disappoint me. If you have made everything else, make the sour cream too. It pairs so well with the sauce, and once again, its mouth cooling quality helps those who cannot handle the heat. This is certainly a “to the taste” kind of deal, which is clear from “measurements” above. I use fat free sour cream because once it’s flavored, no one ever knows the difference and it is completely guilt free! The issue is, once you add buttermilk and vinegar, it gets quite thin. Personally, I like to add a smidge of fat free mayo to fix the consistency. If mayo makes you cringe, leave it out. Other notes for above, Worcestershire really pumps up the flavor, so do not be afraid to use it generously. I also really like the dill flavor with the mango chipotle, so I go extra heavy with that particular herb. If you aren’t sick of reading yet, I should probably mention there is an exceptionally good chance you will have a lot of the mango chipotle sauce and ranch inspired sour cream left over. Don’t fret, here are two simple recipes to remedy this excess. 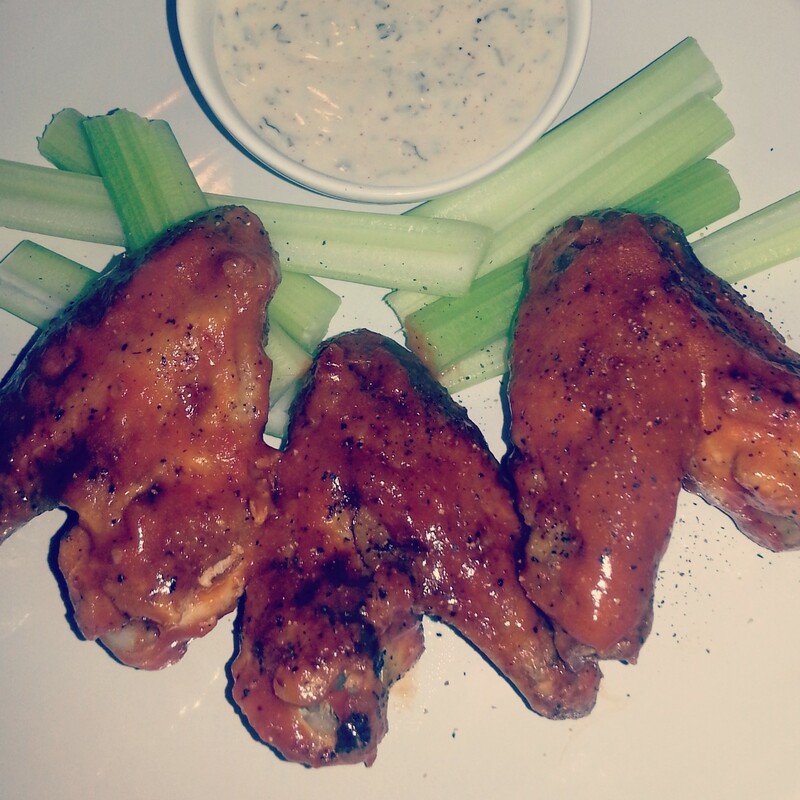 Broiled Chicken Wings: Lightly coat the wings with olive oil, s & p, Goya Adobo Hot seasoning and poultry seasoning. Broil the wings in the oven until crispy on both sides. 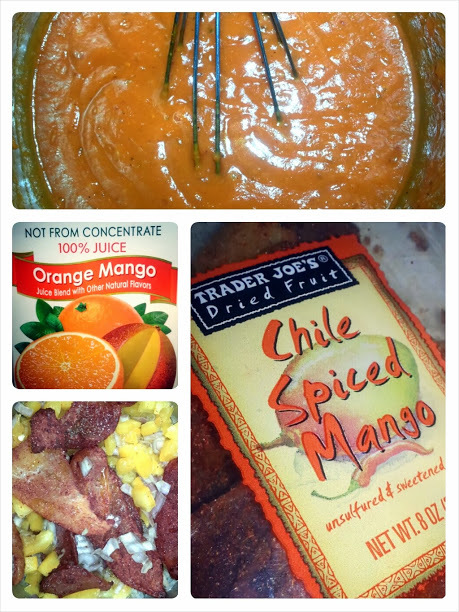 Finish by tossing in hot sauce, then the chipotle mango sauce. DELICIOUS. Serve with the ranch sour cream. 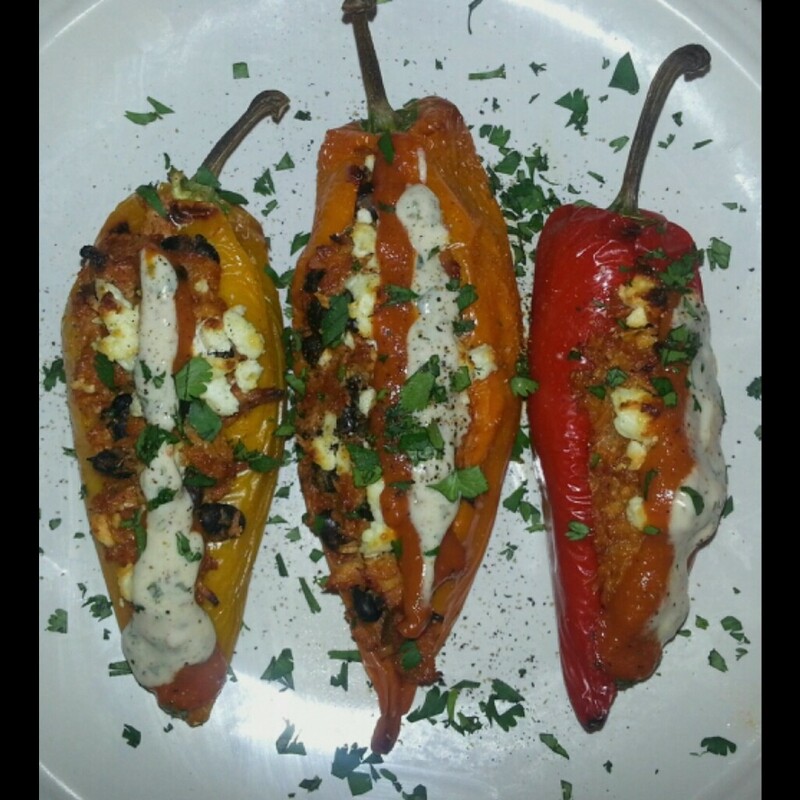 Sweet Peppers Stuffed with Chicken & Black Beans: slice the peppers up the middle. Take out the seeds and the ribs. If you have leftover pulled chicken, toss it with black beans and stuff the peppers. Top with goat cheese and bake at 350 for 20 minutes or so. Before serving, add more chipotle mango sauce and ranch sour cream. DELICIOUS AGAIN.